Posted on May 13th, by Dr Rob Yeung . Do you ever worry that the people around you are judging you silently? Or do you sometimes receive comments or criticism from people that make you feel you’re being attacked? Identify the specific thought that’s worrying you. Are you telling yourself something like “I’m going to look stupid” or “People are laughing at me”? Or has someone said something hurtful to you – perhaps that you’re “pathetic” or that “you’ll never succeed”? There’s a technique called one-word cognitive defusion that can help to take the sting out of such thoughts or comments. 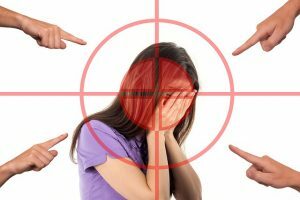 All you have to do is to identify the most hurtful word – and then repeat it out loud to yourself as quickly as you can, over and over again, for 30 seconds. Either find somewhere away from other people – go to a toilet stall at work, for example – or simply whisper the word quietly over and over to yourself. For 30 seconds. And that’s it. The method has been tested by Akihiko Masuda, a researcher at the University of Nevada, Reno. And he found that people who were taught the technique not only believed such negative thoughts less – they also felt less distressed. Often, we cause ourselves more distress by believing our thoughts. But our thoughts are just thoughts. For example, if someone calls you “stupid”, it’s not as if a panel of 100 top experts has run a batch of tests and categorically decided that you are in fact considerably less intelligent than most people. It’s just the view of one person – even if that individual may be someone important in your life. Such thoughts can be very damaging if you allow yourself to believe that they are true. So take a few minutes to dispute them. This is a key technique within the school of therapy known as cognitive behavioural therapy. Get a pen and piece of paper (or open up a note on your smartphone) and write down at least three facts to dispute the thought that you’re having. For example, if you’re concerned that people may laugh at you, write down the names of three people that who do support you. Or if you’re feeling hurt that someone called you a “loser”, write down three pieces of evidence that show you are a winner, perhaps in other skills or parts of your life. Often, simply taking a minute to challenge a negative thought can help you to put it into better perspective. Tough situations can leave you feeling anxious or sad or angry. But a simple technique called affect labelling can help to quell whatever negative emotion you’re feeling. Of course, the technique has been shown in research studies to be beneficial. And it’s incredibly simple. And that’s all there is to it. Simply saying something like “I am experiencing a feeling of sadness” or “I am experiencing a feeling of irritation” helps the more rational parts of your brain to assert more control, which dampens down the emotional response. This next technique is most handy when you need to perform in front of other people – giving a speech at a wedding, performing at an audition or playing in a sporting competition, for example. And it’s based on the idea that you are not transparent. When you have to perform in front of other people, you may worry that the audience can see how nervous you are. After all, you know how your heart seems to be pounding in your chest. You can feel the dryness in your throats and the sweatiness of your palms. But your audience can’t see any of those signs! You may feel that you are transparent – that an audience can see the signs of your anxiety. But it’s an illusion that you are transparent. Audiences really can’t pick up on your emotional state as well as you might expect. When researchers Thomas Gilovich and Kenneth Savitsky have taught people about this illusion of transparency, they found that people immediately gave better presentations. So just remind yourself that you are not transparent: that audiences are not actually very good at detecting how you might be feeling. Oh, and if you’re interested in the science behind that technique, I explain it in Chapter 1 of my How To Stand Out book. In the past, I’ve written about plenty of other techniques related to boosting your confidence and taking control of your emotions. So do click those keywords if you want to cope even more effectively when you’re feeling judged or attacked.